2) M20 – With extended battery life, whispered talk-time alerts, and noise reduction you can make every call worry free. Avoid recharging even longer by using the power switch between calls, and if you have an iPhone, you can monitor battery life onscreen. 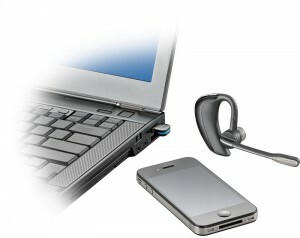 So talk freely knowing you have the time you need and the technology you want, all in a stylish, discreet headset. 3) Voyager Pro B230 – Simply place the next generation Voyager PRO UC headset on your ear to automatically answer mobile or PC calls. With Smart Sensor technology, your Skype or Microsoft Lync Server 2010 presence is immediately updated to show your availability and willingness to engage. Voice prompts announce remaining talk time, connection status and battery level for superior call management. 4) Explorer 240 – For the cost conscious buyer who still wants Plantronics quality, the Explorer 240 is the Bluetooth headset for you. This discreet little headset won’t leave you with a sour taste when it comes to quality performance, and it won’t break your wallet when it comes to price. 5) MX200 – An excellent way to get quality Plantronics sound through an inexpensive corded headset for mobile phones that use one. The discreet microphone on the MX200 ear bud headset is designed to pick up your voice, and only your voice.